Powers: The Fly possessed a number of superhuman powers analogous to the natural abilities of a common fly. In addition to superhuman strength of around Class 10, the Fly possessed reaction time, agility, and speed about three times greater than those of a normal human being. In addition, he had a somewhat heightened sense of equilibrium. The Fly possessed glands in his hands and feet that secreted a mild adhesive, allowing him to stick to most dry surfaces, though he could not support much more than his own weight. Deacon's multifaceted eyes were spherical in shape, and allowed him to see a field of roughly 270 degrees around him. Like the eyes of an insect, Deacon's eyes gave equal perceptual value to all angles; as a result, it was very difficult if not impossible to surprise the Fly even from behind. In addition, Deacon possessed two large, thin, membranous wings growing from his shoulders which enabled him to fly in the manner of an insect. The Fly could achieve speeds of up to 70 mph for nearly 6 hours before fatigue forced him to rest. He could carry about 250 lbs. in addition to his own weight while flying, though this decreased his speed somewhat. In addition, because his wings oscillated at supersonic frequencies, Deacon could generate a number of vibratory phenomena. Deacon could generate powerful blast waves with a range of about 30 feet by "buzzing" at certain frequencies. These blast waves had a force equivalent to that of 50 pounds of TNT at close range. The Fly was also capable of generating ultrasonic vibrations on frequencies enabling him to fracture concrete. The Fly's initial mutation proved unstable, and his powers and fly-like characteristics often fluctuated. At the nadir of his power, his strength had dropped to enhanced human levels and his compound eyes no longer functioned properly. Near the end of his initial life, his fly-like characteristics affected his mental condition, compelling him to adopt some behavior patterns (most notably food preferences) like those of a common housefly. Post-resurrection, he returned to his more human-like form, although his wings now were quickly regenerative, armored and with a very sharpened edge. He also had an acidic vomit that he used offensively and as a means to consume (human) food. Unusual Features: The Fly possessed large, multifaceted, lidless eyes like those of a real fly, and armored membranous wings on his back. Later in his life, he took on more fly-like physical characteristics, including copious body hair and a pair of segmented antennae growing from his forehead. It is not known if the Fly's antennae were functional. (Amazing Spider-Man Annual I#10) - Richard Deacon was a sociopath and a career criminal who became involved in a kidnapping scheme. However, both the police and the costumed crimefighter Spider-Man attacked Deacon and his gang in their hideout, and freed his hostages. Deacon was shot while escaping and sought out Dr. Harlan Stillwell, whom he knew had given medical aid to other fugitives in the past. Stillwell's brother, the late Farley Stillwell, had been employed by J. Jonah Jameson to create the criminal Scorpion for use as a weapon against Spider-Man, but the Scorpion instead became a criminal. Coincidentally, Jameson had approached Harlan Stillwell earlier that day and offered him money to create another superhuman being to oppose Spider-Man. Coerced by Deacon, Stillwell subjected him to a mutagenic treatment that overlaid the genetic codes of a common housefly onto Deacon's own. As a result, Deacon gained considerable superhuman powers. Seeking to prevent anyone from betraying him, Deacon shot Stillwell, apparently killing him. Soon thereafter, Deacon kidnapped Jameson and threatened to kill him if Spider-Man did not meet the Fly in battle at a nearby construction site. Despite the Fly's superhuman powers, Spider-Man was able to defeat Deacon in single combat and freed Jameson. (Amazing Spider-Man I#192) - Discovering Spider-Man while the latter had been handcuffed to Jameson by another foe (Spenser Smythe), the Fly attempted to kill the vigilante, throwing the pair off of a building. Spider-Man managed to use his superhuman agility to protect himself and Jameson, and was only knocked unconscious by the fall. (Amazing Spider-Man I#193) - The next day, the Fly embarked on his scheme to rob the Metropolitan Museum of Art. Tricking the guards into believing he was robbing an exhibit of Egyptian artifacts, the Fly instead looted the museum's other treasures. His plan was deduced by Spider-Man, but Deacon managed to defeat him in battle and escape. Spider-Man combed the city looking for the Fly, but in the end it was the NYPD who defeated him using a weapon on loan from SHIELD. (Spider-Woman I#30 (fb) - BTS) - Deacon escaped custody, but soon discovered that his powers were waning. 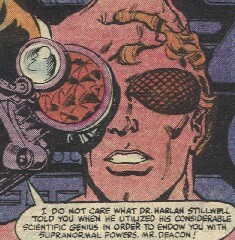 (Spider-Woman I#30) - Traveling to San Francisco, the Fly sought out Dr. Karl Malus, a criminally inclined scientist who specialized in the study of superhuman beings. Malus formulated a plan to augment Deacon's powers with a blood transfusion from Spider-Woman, and so the Fly attacked her unsuccessfully. After he escaped her, Malus suggested that he kidnap her associate Scotty McDowell. However, Spider-Woman followed the Fly to Malus' headquarters and, after a brief fight, defeated him. BTS - Despite what Malus claimed, the Fly's powers did not wane; instead, his unstable mutation made him even more fly-like, and he found himself compelled to muscid behavior such as eating garbage. (Moon Knight I#35) - The Fly was interrupted in the course of a penthouse robbery by Moon Knight, but was more than a match for the hero. Using his vibratory power, he blasted Moon Knight into a wall and fled. The resultant spinal injury left Moon Knight paralyzed for several weeks thereafter. (Spectacular Spider-Man II#86) - The Fly, reduced to lapping up spilled soda for nourishment, again confronted J. Jonah Jameson. He soon found himself battling Spider-Man and the Black Cat, and was once again defeated. (Amazing Spider-Man I#276) - The Fly, more mutated than ever, escaped a mental institution and flew off to attack Spider-Man once again. He was preparing to do so when the criminal-killer Scourge, disguised as a garbage man, shot him in the back with an explosive bullet, killing him. (Punisher VII#5) - Aided by Dormammu's dark magic, the Hood resurrected the Fly along with several other of Scourge's victims to fight the Punisher. The Fly was once again in his his near-human form. (Punisher VII#6) - The Hood addressed the assembled resurrected villains (including the Fly), warning them that failure to kill the Punisher would leave them dead again after 30 days, but lying to them that it was the Punisher disguised as Scourge who had killed them. Each one resurrected had been augmented, armed and costumed by the Hood. Somewhat defiant, the Fly later left the group, commenting on a gravelly static in his head since resurrection. (Punisher VII#7) - While Bird-Man waited outside, the Fly ate the remains of Tina in a red-light district hotel, talking madly to himself. The Black Stream agents sent by the Hood to pacify the Fly were all killed along with hostess Millie, her face dissolved by the Fly's acidic vomit. The Punisher then arrived, aiming a gun at Deacon. (Punisher VII#8) - The Fly protected himself with his wings from the Punisher's blasts, escaping through a window but with a wounded wing from the Punisher's knife. Bird-Man took the Fly away as other resurrected villains, disguised as (1980s era) Avengers, arrived to engage the Punisher. Soon defeated, the villains regrouped with the Fly's quickly regrown wing slicing the Punisher's motorbike before flying up as reinforcements arrived led by the Hijacker and his tank. (Punisher VII#9) - Amidst the chaotic fight, the Punisher incapacitated the Fly using an electric whip. (Venom II#16 (fb)) - The Fly robbed several million dollars from a Kingpin operative. 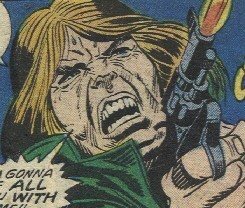 The Kingpin then sent Hobgoblin (Phil Urich) to kill him and retrieve the money. (Venom II#5) - Calling himself the Human Fly again, he kidnapped various people to slowly consume, including a senator's daughter, but was beaten up and apprehended by Venom (Flash Thompson). (Venom II#16) - The Human Fly spoke to Venom while aboard an armored transport to the Raft prison, lying to Venom that he stole the money to support his son in order to gain sympathy. The Hobgoblin attacked the train and tried to kill him, and the two fought furiously; Deacon using his acid spit and teeth against the Hobgoblin. Venom knocked Hobgoblin off the train and let the Human Fly escape to help his son, but Venom realized later that he'd been lied to. (Venom II#17) - Crime-Master introduced the Fly to his existing team of Megatak, Death Adder and Jack O'Lantern, all secretly watched by Venom. The Human Fly did not trust Crime-Master and so kept himself aloft with his wings. Forced into action by Eddie Brock, Venom's clumsy attack brought the Human Fly into Crime-Master's team and he carried Death-Adder upward to attack Venom, also vomiting acid against Venom, who was nevertheless able to escape. The group's attention then went to the webbed-up Brock, who was later forced to bond with the Toxin symbiote. (Venom II#19) - While Venom tackled other members of Crime-Master's group, the Human Fly went to Venom's mother's house to kidnap her. (Venom II#20) - Venom tracked down his mother, Rosie Thompson to the Human Fly's hideout and webbed him up. Venom then ripped the Human Fly's wings off, demanding he reveal where Crime-Master was. (Venom II#22) - The Human Fly was incarcerated in a high security prison (likely the Raft) while Venom informed the Avengers of his fight with the Savage Six. (Superior Foes of Spider-Man#12) - The Owl had Human Fly join Boomerang's Sinister Sixteen in a raid on Chameleon's hideout. The Fly was one of numerous Jameson-financed Spider-villains over the years, and was obviously patterned after the first such baddie, the Scorpion. Amazing Spider-Man Annual I#10 offered a prize to any reader who could explain how Spider-Man, in the total absence of all clues or crime scene access, figured out that Deacon had killed Stillwell. As far as I (and the Marvel Indices) know, said answer has never been provided. 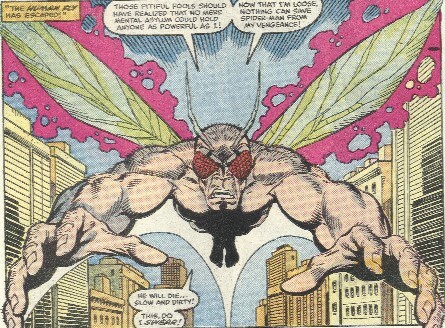 Malus used the Fly's DNA to transform Scotty McDowell into the Hornet, who basically had the Fly's powers minus the freaky eyes, but the process was undone within two issues. The Spider-Woman issues were Malus' first appearances, well before he wound up turning Erik Josten into Goliath and later working for Power Broker Inc. The Spectacular Spider-Man story was part of Assistant Editors' Month, and as such was drawn by Fred Hembeck. Notoriously, it also contains serious material on the Spidey/Black Cat relationship that Mantlo was developing, and even though the two pages relating to this were drawn in serious style by Al Milgrom, many fans were unhappy that such developments occurred in a "humor" issue. 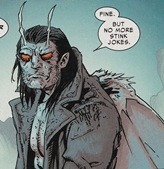 Deacon was also seen among the afterlife characters in Sensational She-Hulk#53. 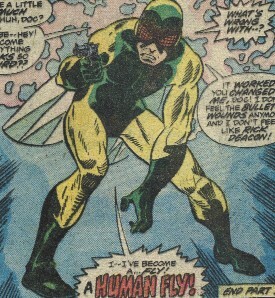 Human Fly has a one page profile (not very informative) as one of "Spider-Man's Forgotten Foes!" in Web of Spider-Man Annual#3. 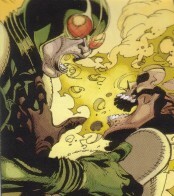 The Human Fly is shown on the front cover of Venom II#21, but doesn't actually appear in the issue. I suppose some could argue that this is a different character, but the two seem similar enough, and since a few other established Marvel villains appeared in snack ads (the Red Skull, Nitro, the Abomination, etc. ), why not the Fly? --I do actually think they're different enough that they may not be the same guy--Snood. Profile by Omar Karindu. Updated by Grendel Prime (Punisher, Venom issues). Did Mantlo have flies on the brain in the 70s, or what? This is also the guy who brought back the Locust to battle the Hulk.